The Gloster Meteor was the first British jet fighter and the Allies' first operational jet. Designed by George Carter, it first flew in 1943 and commenced operations on 27 July 1944 with 616 Squadron of the Royal Air Force (RAF). The Gloster Meteor was not an aerodynamically advanced aircraft but the Gloster design team succeeded in producing an effective jet fighter that served the RAF and other air forces for decades. Meteors saw action with the Royal Australian Air Force (RAAF) in the Korean War, and remained in service with numerous air forces until the 1970s. Two Meteors, WL419 and WA638, remain in service with the Martin-Baker company as ejection seat testbeds. 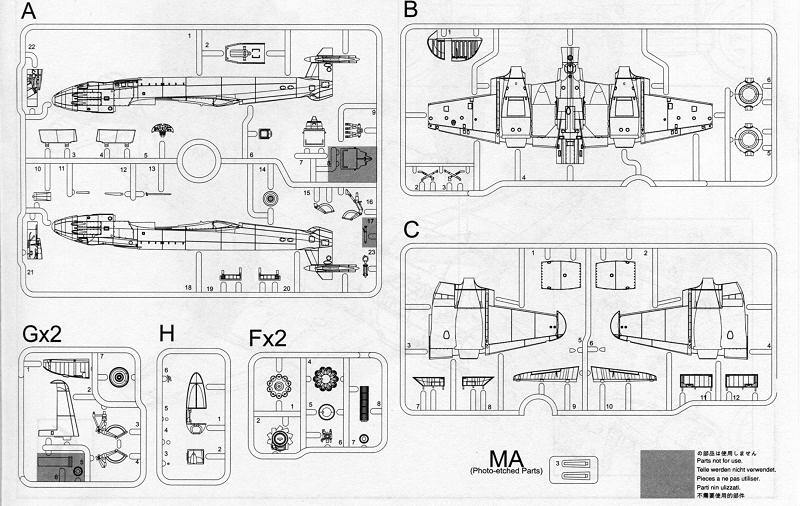 This is the second early Meteor release by CyberHobby and it provides all the extra bits required to do the initial F.1 variant. This is basically the different canopy as worn by this variant and early F.3 versions. As is appropriate for this version, there are no speed brakes on the wings. If you recall Tamiya did a major gaffe by including these on their kit as they used a test aircraft for the basis of their kit. This one contains eight sprues. One is clear for the canopy (which has a separate section so you can pose it open). Two are duplicated for the engines and for the stabs/main gear. Detailing is quite good with crisply formed engravings. The kit has separate ailerons, rudder, and elevators. The controls were not spring loaded so seeing some deflection is not unusual. However, many photos will show them with them in neutral. None of the dozens of images in the reference showed the plane with the flaps lowered. You get a very well done cockpit with seat control stick and proper sidewalls. The cockpit tub also forms the nose gear well . All of the gear legs are well detailed and will require the wheel to be installed prior to finishing gear assembly. There isn't a lot of room for nose weight and this one will probably need it. Best place to put it would be behind the cockpit tub once the fuselage halves are together. The kit also contains two full engines. The upper wing engine hatches are separate to allow one or both of these to be seen. Leaving them out is not really an option as you have to install them to prevent a 'see through' effect for the nacelles. I should mention that there is a photo etch fret that has two antennas on it. Markings are provided for two planes. One is the box art aircraft with 616 Squadron, the only active unit to fly the plane in late 1944 while based at Manston. The other is an aircraft traded to the US for a P-59. Instructions are well done with color references in Gunze and Model Master paints. As seems to be more the norm than the exception with some companies, no interior or other 'underway' painting info is provided. You will want to use British Interior Green for the cockpit and wheel wells. 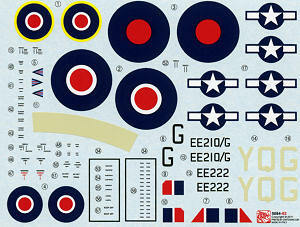 The decal sheet is well printed and should provide no problems. If you are a fan of the Meteor or just like early jets, then this one has to be on your list. The detailing is excellent and should make into a very nice model when you are finished. If you would like your product reviewed fairly and fairly quickly , please contact me or see other details in the Note to Contributors.